← Courtship Dances: weedy sea dragons, grebes and peacock jumping spiders. Monotropa is a Genus of plants that are incapable of performing photosynthesis. But, as living organisms, they require a sufficient source of carbon to live! Well, what this plant does is quite extraordinary: it obtains carbon via myco-heterotrophy! That is to say, Monotropa leech carbon from fungal systems. But wait… you’re probably skeptical because fungi do not contain plastids for photosynthesis. Well, yes, you would be correct in that respect… but there are many fungal relationships with other organisms, which facilitate carbon acquisition in fungi – and so, Monotropa can subsequently extract carbon from the fungus because the fungus contains resources from the host plant. (I do not think Monotropa have the machinery to acquire carbon directly from another plant). If you’re having issues visualizing this here is a diagram that shows the relationship between Monotropa, a fungus, and a conifer. 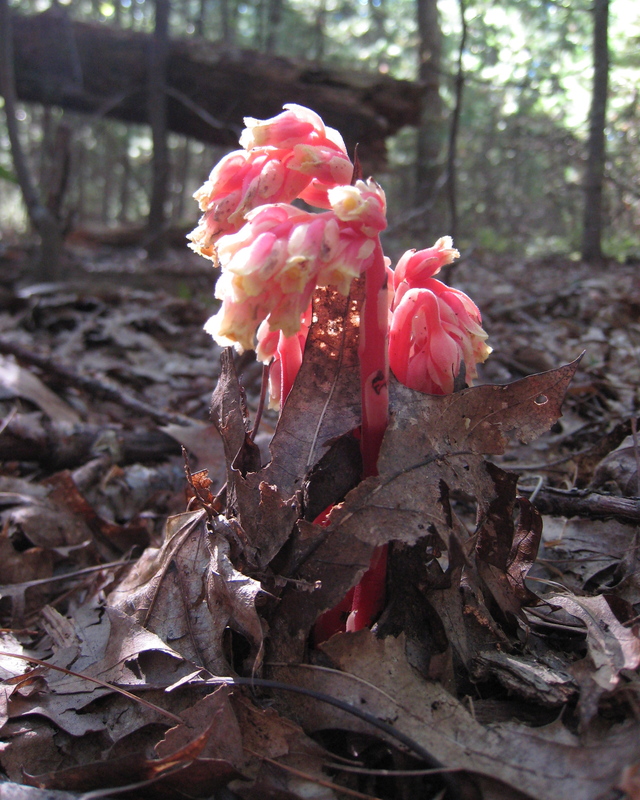 (Monotropa is leeching carbon from the fungus, which received a carbon donation from the conifer). 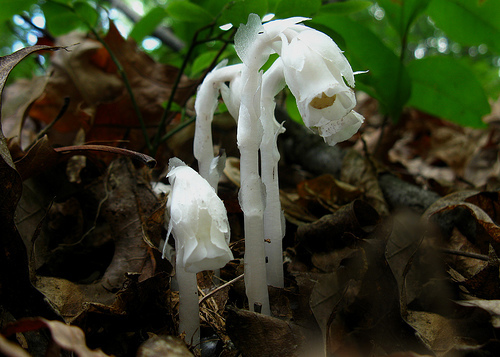 Monotropa hypopitys, a non-photosynthetic plant that obtains carbon through myco-heterotrophy. So what Monotropa and other myco-heterotrophs do, is they ‘parasitize’ fungal mutualisms occurring between fungi and other species of photosynthetic plants. Think of it as being analogous to tapping into someone else’s power, water, or oil, and siphoning it for your own personal utility because you can’t afford your own. 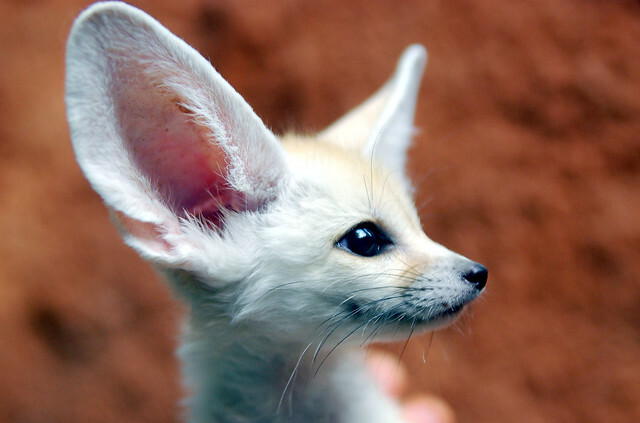 Yeah, these plants are pretty extraordinary. Some species of Monotropa are actually colourless, owed to the absence of pigments! It’s lack of phtosynthetic capacity is also reflected in it’s reduced morphology – it does not possess leaves or branches, which are typically used to increase the efficiency of capturing light energy for photosynthesis. Sidenote: Although many people categorize Monotropa as ‘saprophytic’, this is not entirely correct… Monotropa may (indirectly) take up nutrients from decaying vegetation, but their primary source of carbon is from the parasitization of fungal mutualisms with other, photosynthetic plants. The more proper classification for Monotropa carbon acquisition is “myco-heterotrophic”; not saprophytic. Even if the vegetation is dead, the fungi would be saprophytic, not the Monotropa. Monotropa cannot take directly from plant tissues.